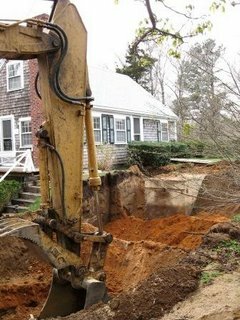 Actually, it’s my septic system that’s now a big hole in the ground. The heavy equipment, which looks like it just came off the Big Dig retired list, was fired up at about 8:30 this morning and is currently digging out the old tank. I’ll be very glad to have this job over and done with, so I can set about enjoying spring planting, but seeing the front yard turned into a 10-foot-deep trench is a little unsettling. On a different note, an apology of sorts is owed to Mid-Cape Home Centers. Met with my new best friend Mike on Saturday to begin picking out bath fixtures. They don’t have any more floor displays than previously noted, but Mike does seem to know his stuff. The fact that I had to make an appointment several days in advance remains somewhat annoying, but I was pleased with the service he provided. Saturday did have its low spots, however – specifically, walking into the basement/garage to find a 5-foot-wide pool of water spread out across the floor. The hot water heater, which had been threatening failure for years, I’m sure, had decided its time had come. The plumber was responsive enough when I called, and seemed sure he could get a replacement in by sometime today (Monday), but his cost estimate – $1,000 – consumed what little wind my sails were still holding. I’m beginning to feel like I’ll have rebuilt this house from the inside out by the time my renovations are complete. Renovating on the Cape can, indeed, be an ennervating experience. One would think, with all the money that gets poured into residential construction on this small spit of land, that the building pros and their suppliers here would have the process down to a science and that the relatively modest redo of two small bathrooms would be a piece of cake. Instead, one gets the feeling that contractors and, especially, retailers feel the need to reinvent the renovating wheel with each new project. It all comes down to the perceived boundary of the bridges. Boston is a mere 90-minute drive away, and its wealthy, South Shore suburbs are even closer. But Cape homeowners appear to be oblivious to the world of product- and service-providers that exist just across the Bourne and Sagamore bridges – or they’re just too lazy to drive the extra half hour to find some decent options. Either way, this insular thinking means residents here, though within easy reach of a major metropolitan area, might just as well be living in a Midwest rural outpost when it comes to market competition. First off, finding a supplier with a decent, well, supply of plumbing products on the Cape is well-nigh impossible. Mid-Cape Home Centers – the local contractor resource of choice – appears to be a firm believer in the Henry Ford, any-color-so-long-as-it’s-black, school of customer choice. Even their “Complete Home Center” showroom in the big city of Hyannis displays a grand total of 3 toilets, two pedestal sinks and a couple of vanities. And if you want to know what any of these products cost, you’ll have to sign in and speak with a representative – keeping price tags up to date on this comprehensive inventory is, apparently, beyond the abilities of even this “Complete” retailer. The people working “customer service” are often little more than catalog pullers – come in knowing exactly what you want, and they can pull the catalogs and write up your order. But if you need a little comparative guidance, be prepared for frustration. But, then, I’d have to cross the bridge. It’s been a while since I’ve written, and in the meantime I’ve found, purchased and moved to my new home in Brewster, Mass. It came together as a kind of example of kismet – my back-up offer actually being accepted after a primary offer fell through – and now this house feels like a home I’ve lived in for years. Spring has really settled into these parts. On the Cape, spring appears to be a real season – instead of the three days between 35-degree weather and 80-degree weather one generally gets in Chicago. It lingers and teases a bit. Daffodils are in bloom all over town, the weeping cherry tree that I see through my office window is covered in feathery red blossoms – and traffic is picking up noticeably as snowbirds return from Florida and weekend homeowners visit to prepare their retreats for the summer. Bart and I even splashed ankle-deep through the very cold Atlantic this weekend, walking out on the sand flats that stretch almost a mile during low tide. So, new season, new beginnings. A cliche, perhaps, if this were fiction. But this is my life, and I’m enjoying the chance to start up a new chapter.